Here's a collection of screenshots from users that couldn't figure out why their sticks were "misaligned". They've all accidentally mapped a direction of their stick to the "full surface" mapping which is sometimes needed for analog triggers. 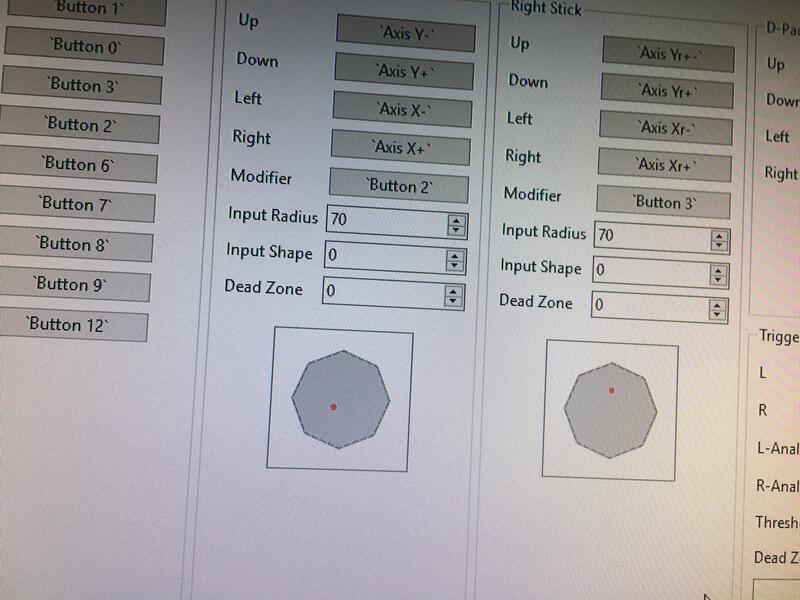 This is caused by not having the stick centered when clicking the mapping button. The mistake is too hard to see. "+" vs. "-+" or "-" vs. "+-". I've renamed full surface analog inputs to be more visually dissimilar from their underlying inputs. 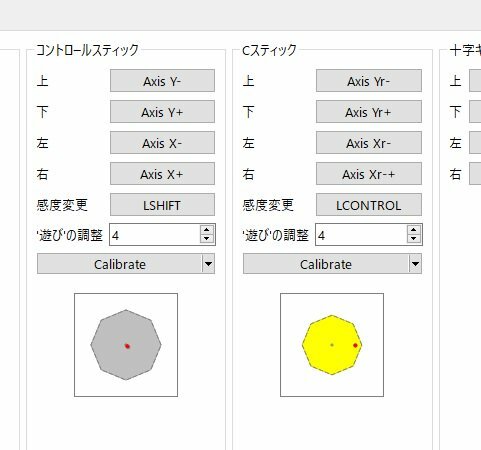 The old naming was of the form, "Axis X-+". The new naming is "Full Axis X+". I've added the ability for the old names to still function but new mappings will take on the new names. This should hopefully make future wrong mappings easier to detect by users. Other than Triggers, what kind of input would use this? Can we just call them "Trigger" instead? @BhaaLseN It's not necessarily a trigger. And sometimes triggers don't use the "full surface". 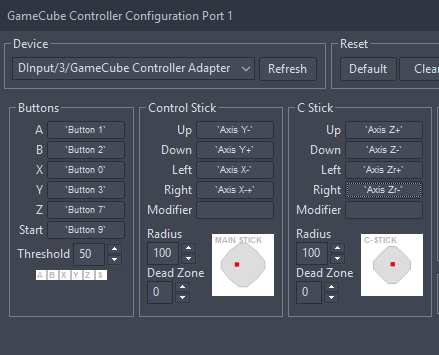 I think if "Trigger X+" showed up when trying to map an analog stick that would lead to different confusion. And if it didn't show up when mapping triggers (which it sometimes wouldn't) then you'd have confusion there as well. We really don't know the physical input type of an axis which is kinda the whole source of this "problem". This change at least makes it apparent when mixing "full-surface" mappings with typical signed mappings. I have trouble finding anything about what a "full-surface" ...thing is, or should be (what's even a surface? That feels 2D to me, not like a 1D Trigger/Axis). So I'm a bit wary whether adding the word "Full" would make much of a difference without raising the question "What's the difference between Full Axis and the normal Axis?" Looking at those screenshots again, maybe we have a different problem here (aside from the fact that the single character difference can easily be overlooked) - namely that people don't recognize which mappings are conflicting with each other. Can we (sensibly) detect and highlight "Axis X+" and "Axis X-+" for example so the user looks at them specifically, while "Axis Y+" and "Axis Y-" are fine? Even if a user doesn't really understand the difference they can at least see that there IS a difference and solve the problem. I don't think it makes sense to highlight "-+". The mappings are potentially valid. Comparing the mapping expression against the 3 other directions to detect mis-mappings would be hacky and not foolproof. I don't think highlighting alone would alert users of the problem. Users can't even reason that a blinking red "calibrate" button means they should calibrate. …ually dissimilar from their underlying inputs. e.g. "Full Axis X+". LGTM, should be enough to at least make the mistake obvious to users. I agree that the +- thing is really easy to miss and this at least makes it easier for us to debug, even if it's not immediately obvious to users. default Very basic checks passed, handed off to Buildbot.